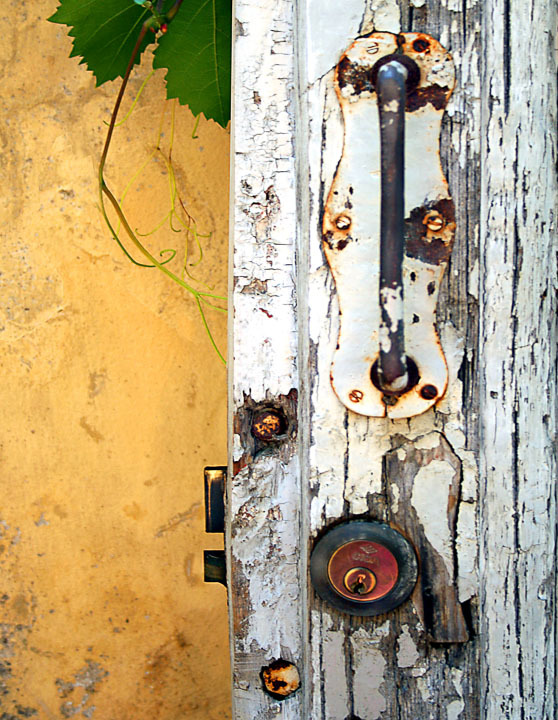 This weathered door shows the beauty that Europeans find in old age of all sorts. 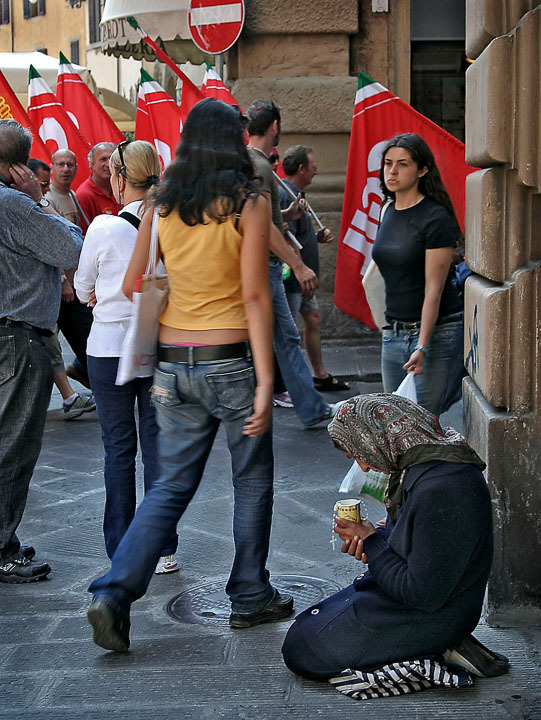 Shoppers, beggers, protesters, patriots and tourists comingle and make for fascinating people watching. 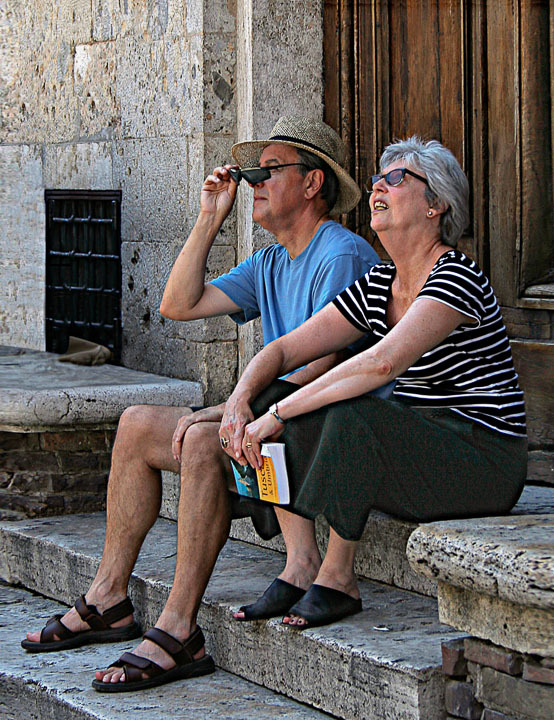 Tourists are easily awe struck as they gaze upon the sights of Italy's past. 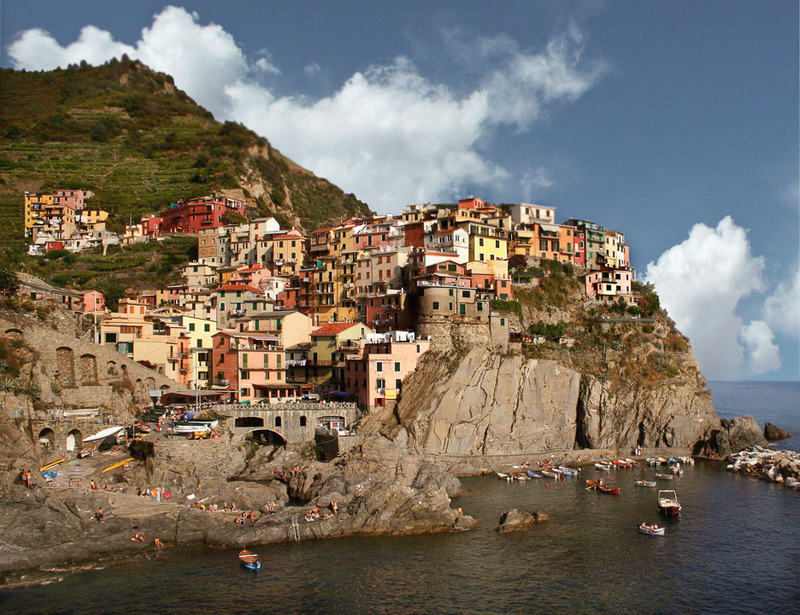 Tourists must go by train, bycycle or hike in to visit the famed five villages known as Cinque Terre. 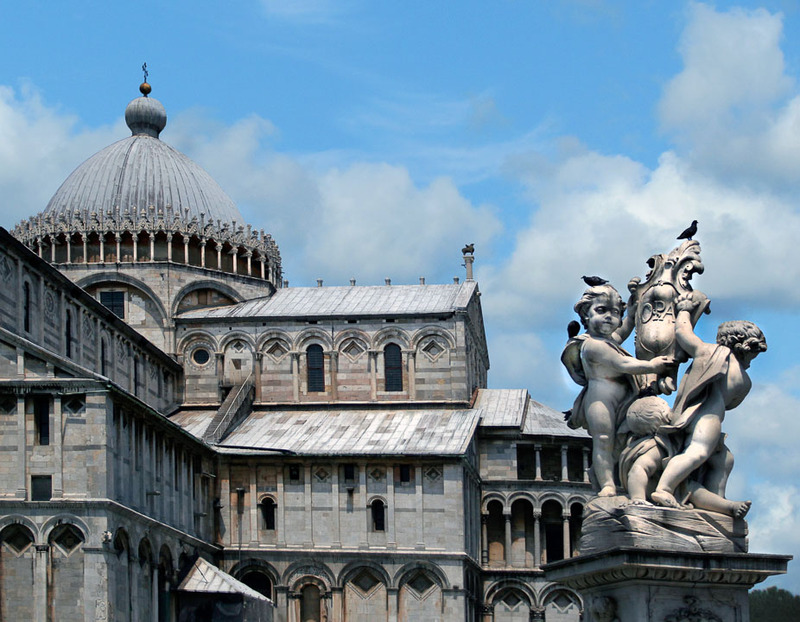 My take of the much photographed tower includes the cherubs of the neighboring cathedral. 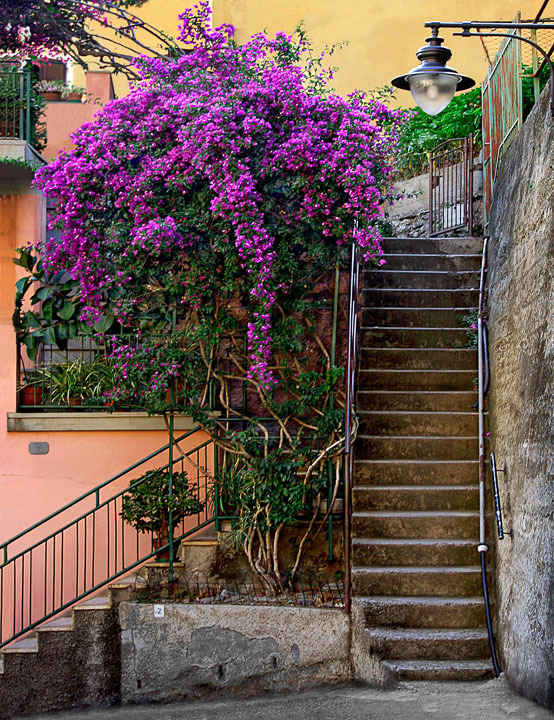 There are many steps to climb as you visit the seaside villages of Cinque Terre. 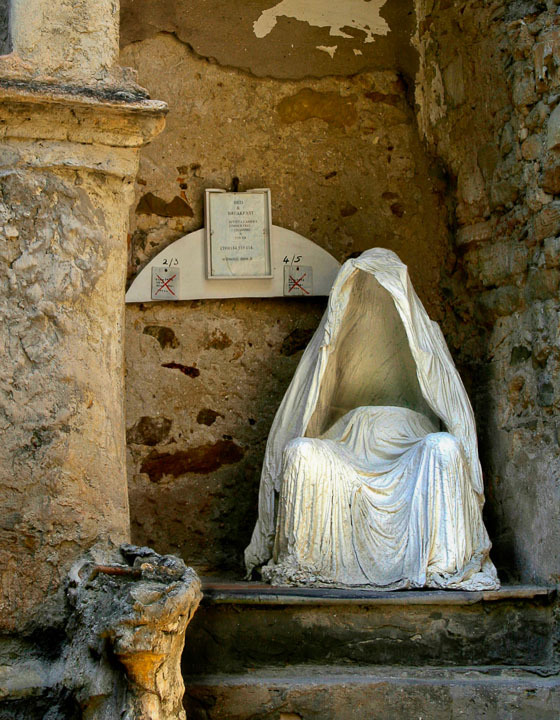 A ghostly figure at the entrance to a bed and breakfast in this hillside artist's colony. 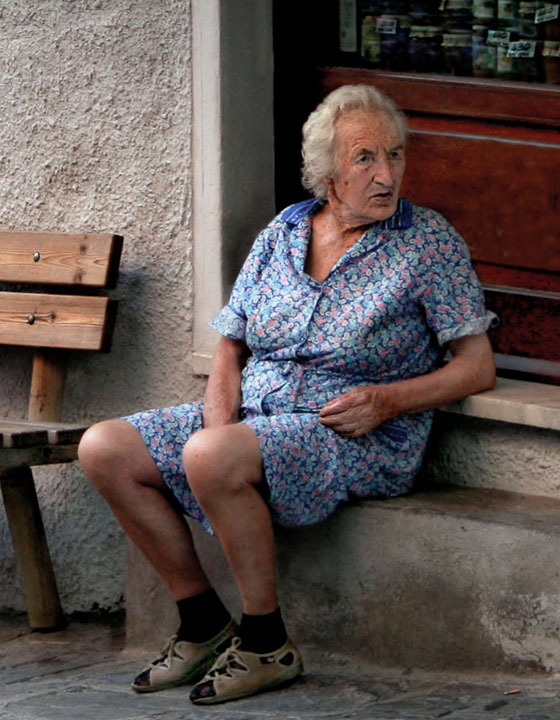 She watches the passing parade from her regular place in the village of Manarola. 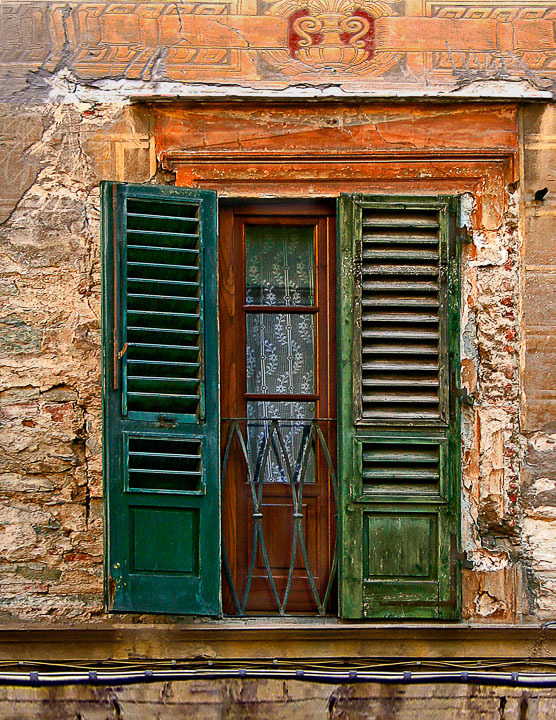 An old door reminds us of Italy's grand and glorious past. 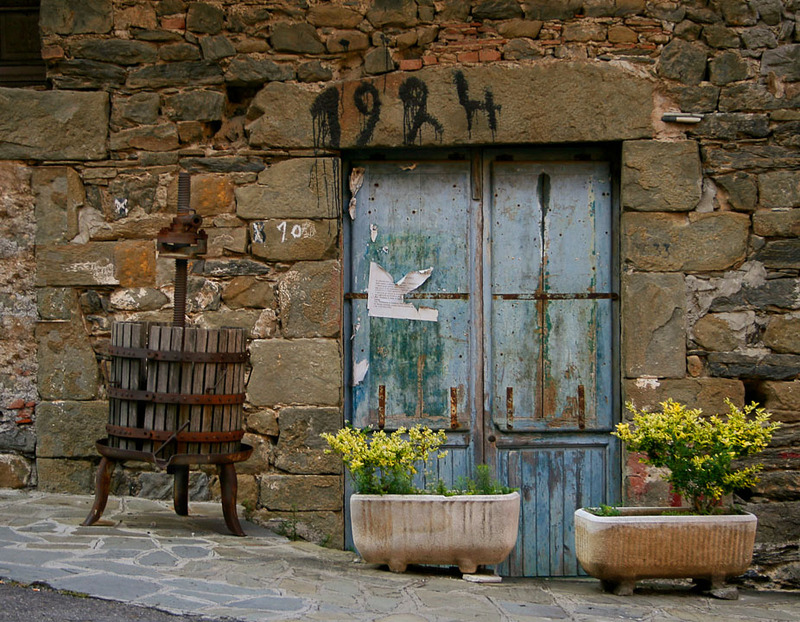 An old winery in the hillside village has been making wine there since 1924. 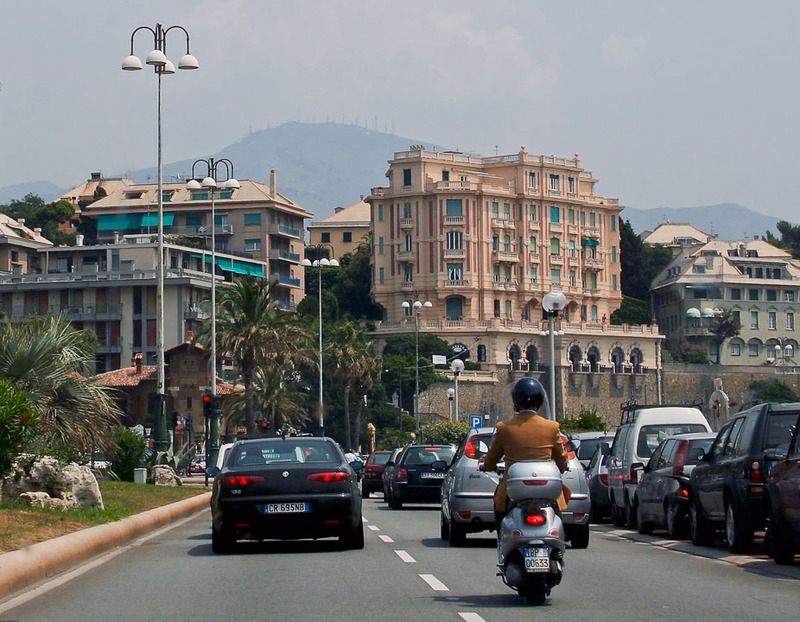 A drive along the coast from Nice and across the border into Italy. 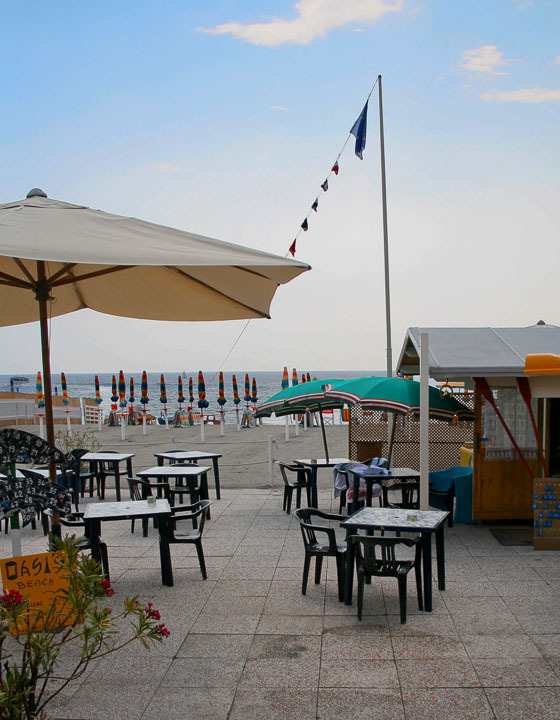 The blue of the sea and gold of the sun are favorite colors of southern Italy. 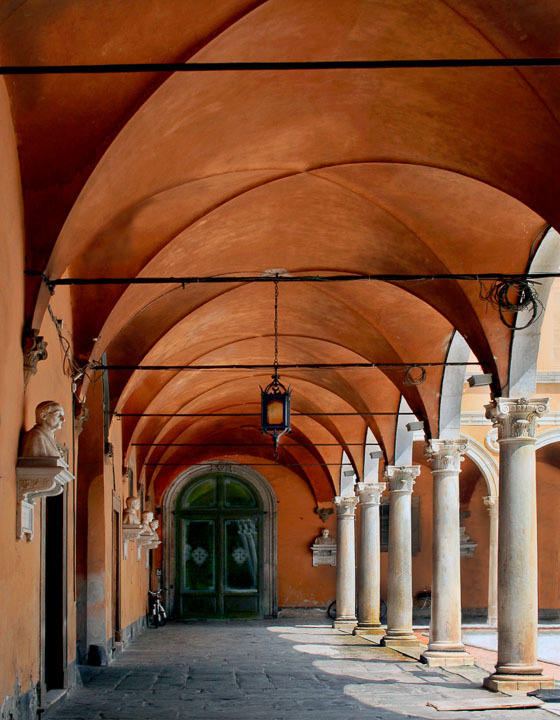 You'll walk under many arches as you explore the historic architecture of Italy. 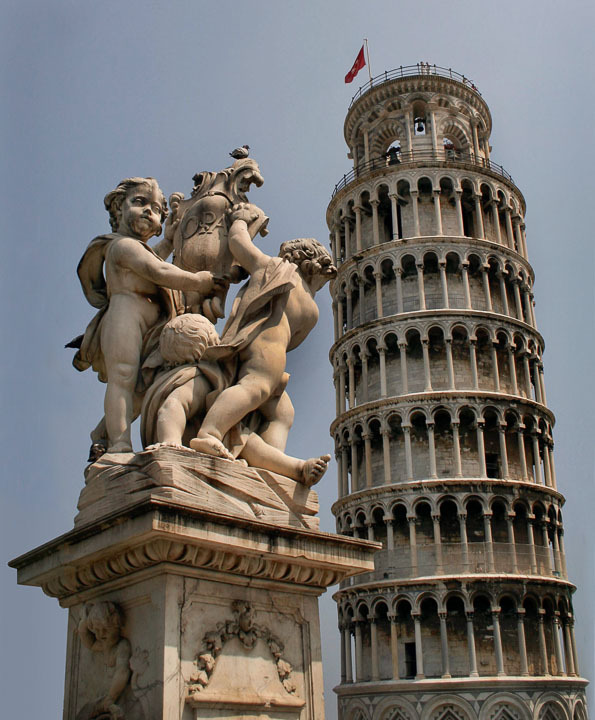 The Cathedral of Pisa is located just along side of the leaning tower. 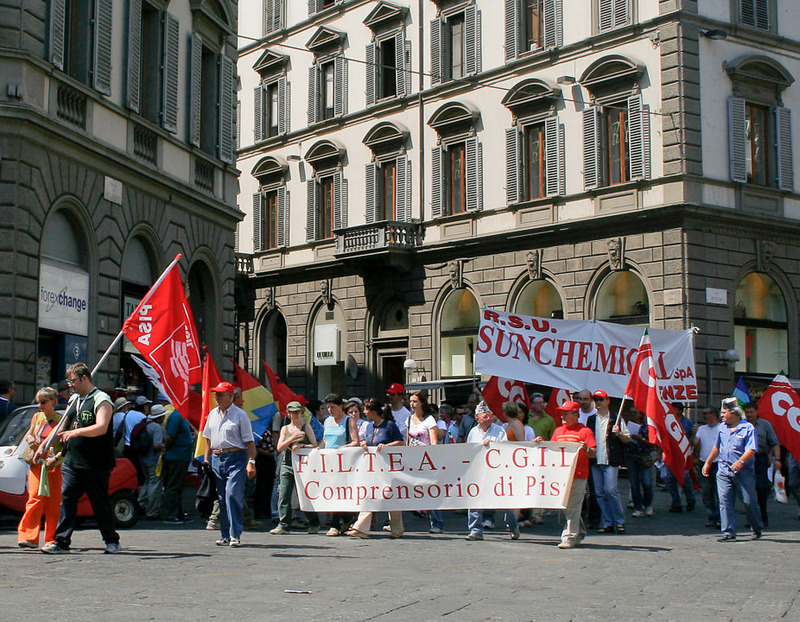 Strikers hoping to send a message to their leaders are an everyday sight in the larger cities of Italy. 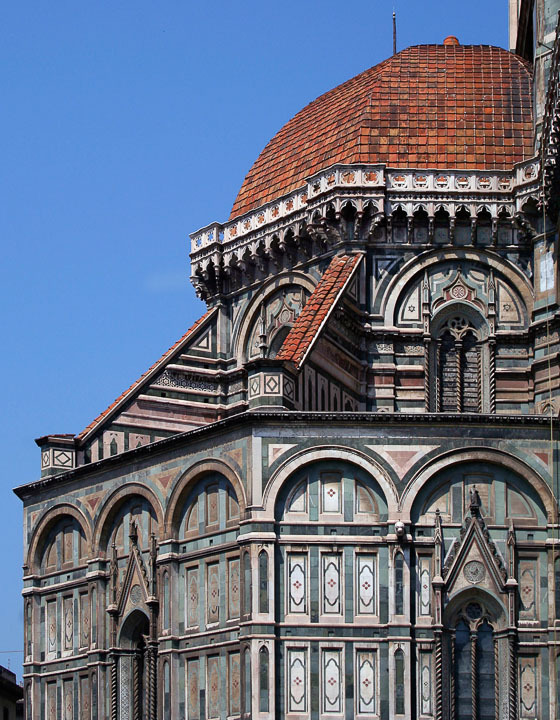 The Bascillica Santa Maria is a spectular sight with its ornate stone and tile work. 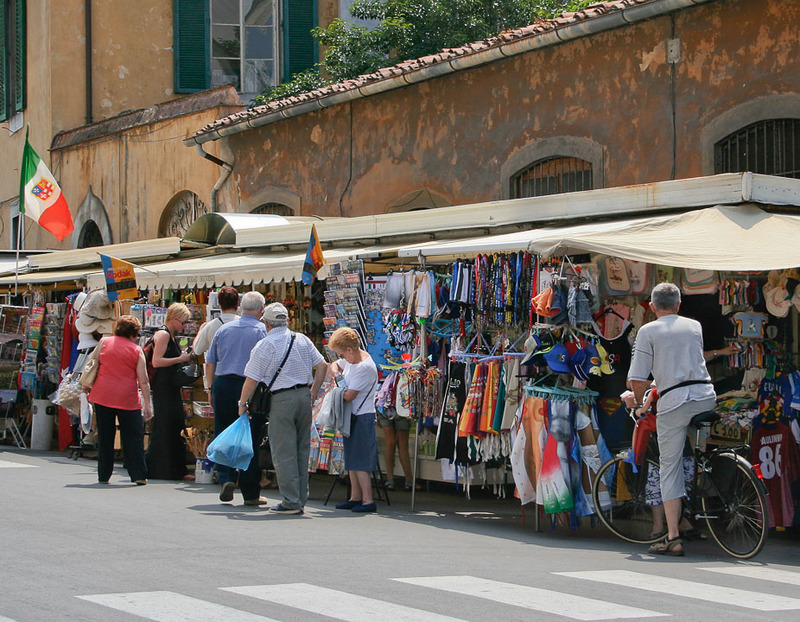 One of the many souvenir stands surrounding Florence's Bascillica Santa Maria. 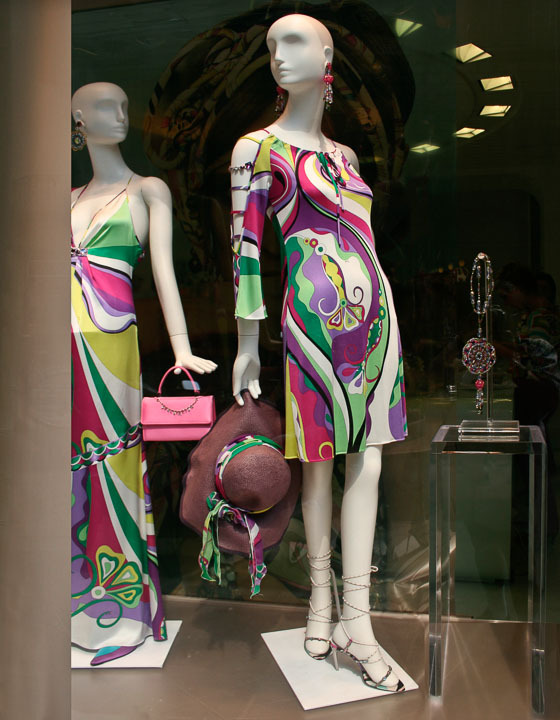 A more modern display of the latest styles in Florence fashion. 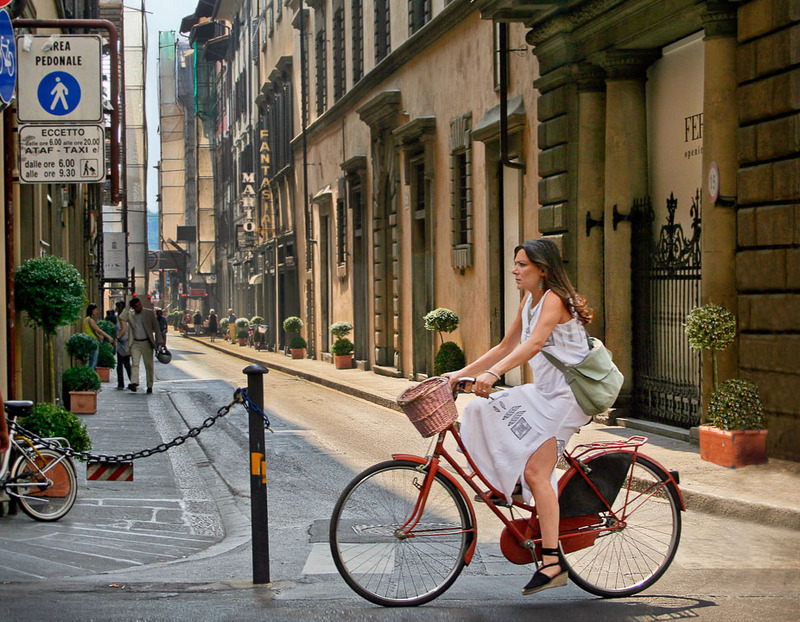 Two wheeled vehicles are one of the best ways to get around Florence. 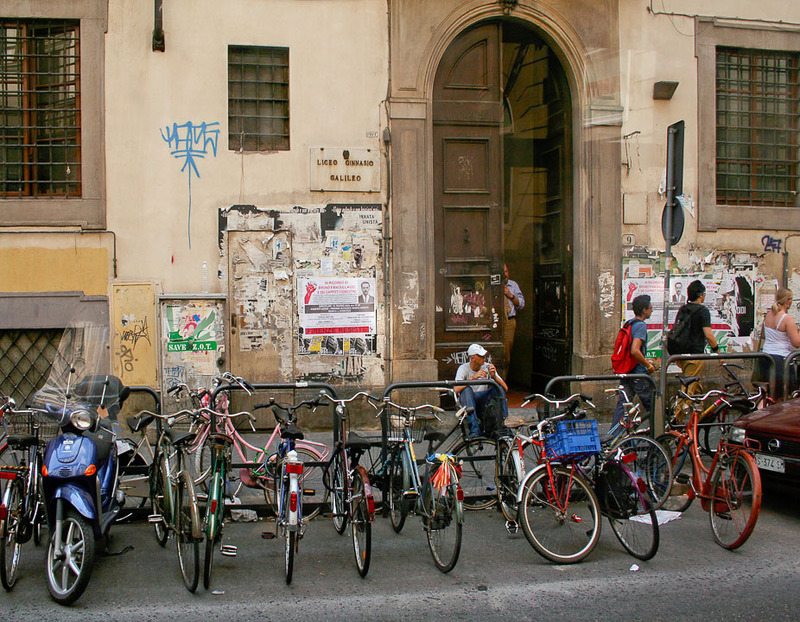 Bikes and motor bikes are much easier to park than cars in the busy streets of Florence. 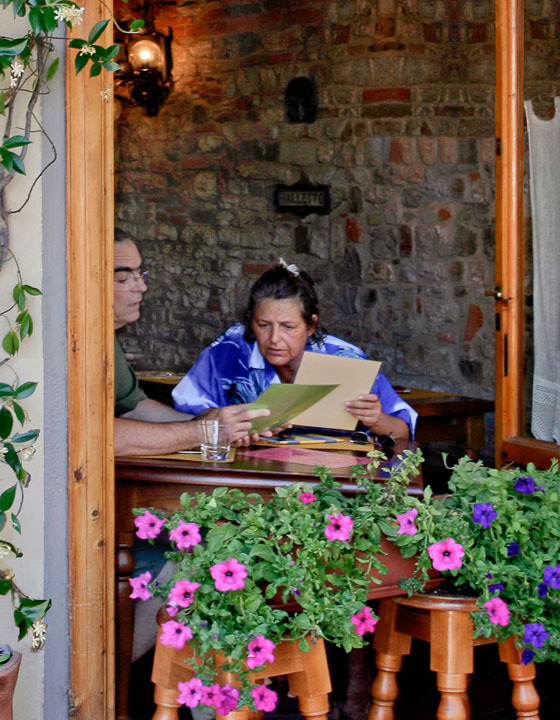 Irresistable dining choices offered make for many difficult decisions. 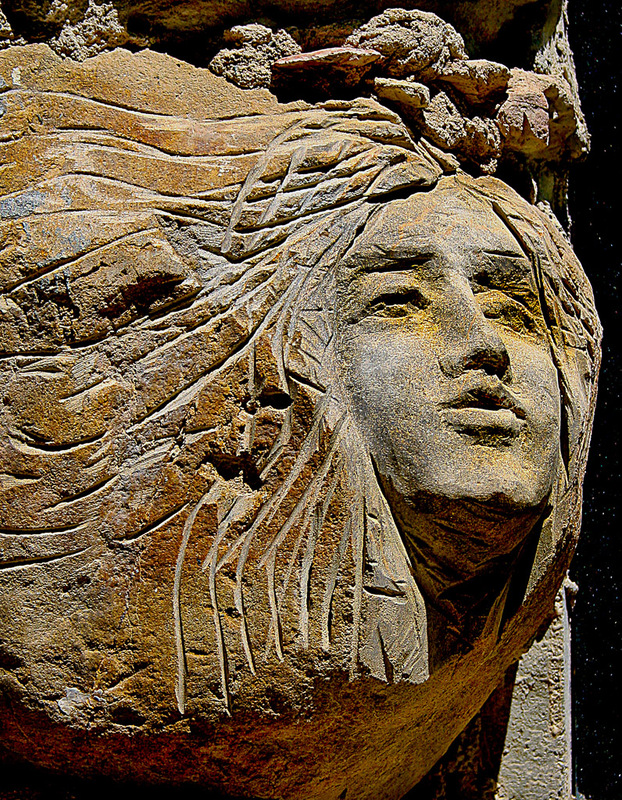 Unique and beautiful sculpture is found in even the smallest towns. 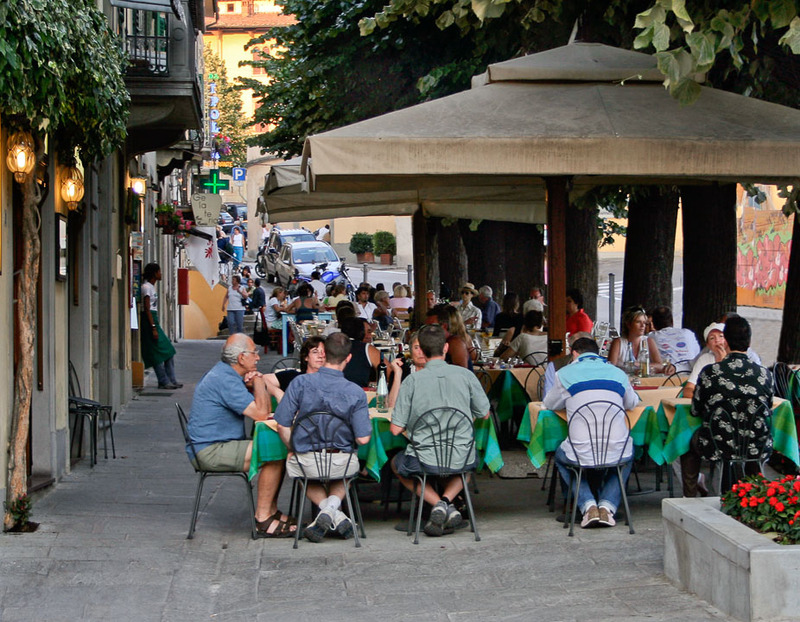 Panzano's main street leads directly up to the medieval church that was renovated 100 years ago. 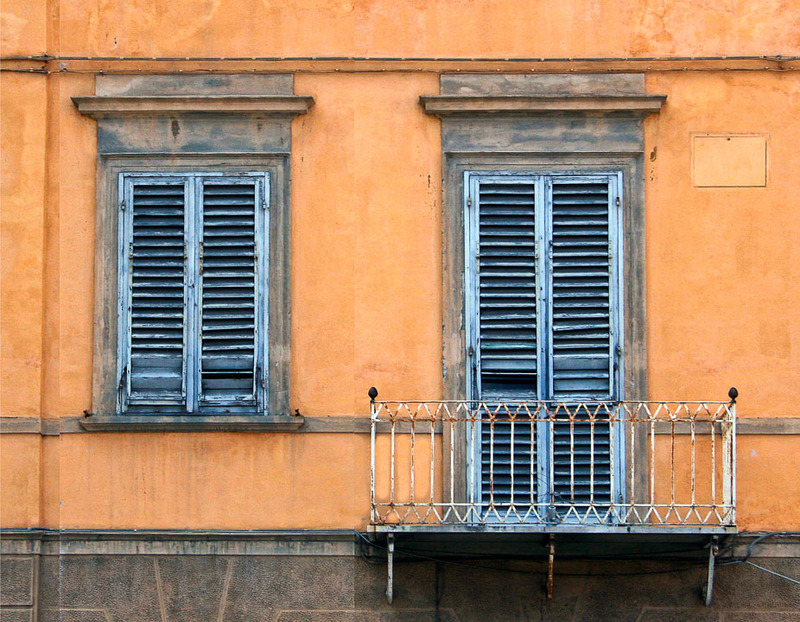 As we expected, the Tuscan country side is a photographer's delight. 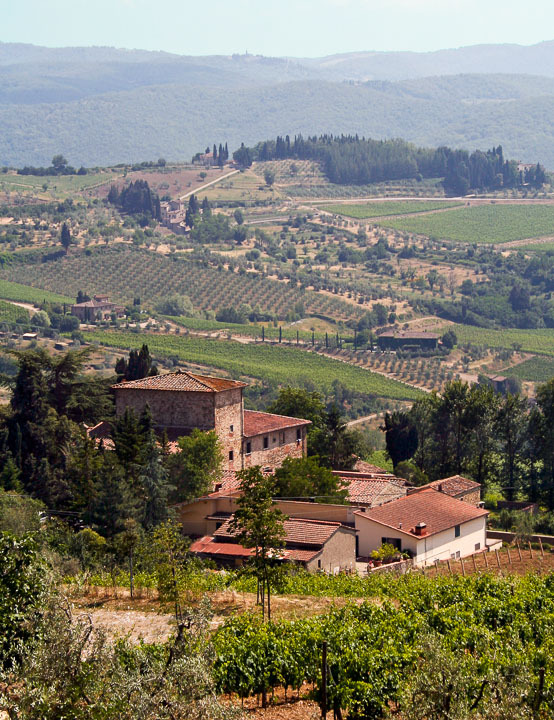 The view from the other side of Fiosole looks out over the beautiful Tuscan countryside. 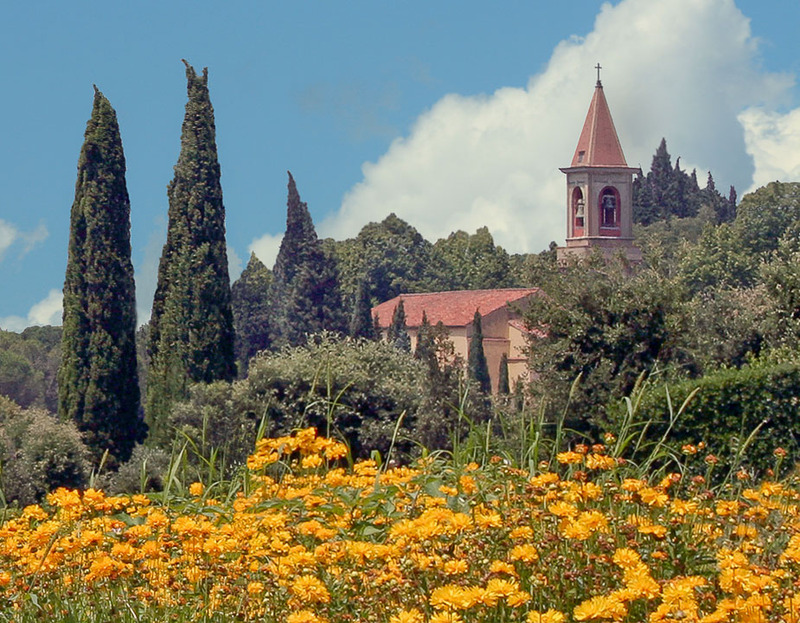 Fiosole sits perched in the hills overlooking Florence and offers peaceful refuge from the busy city. 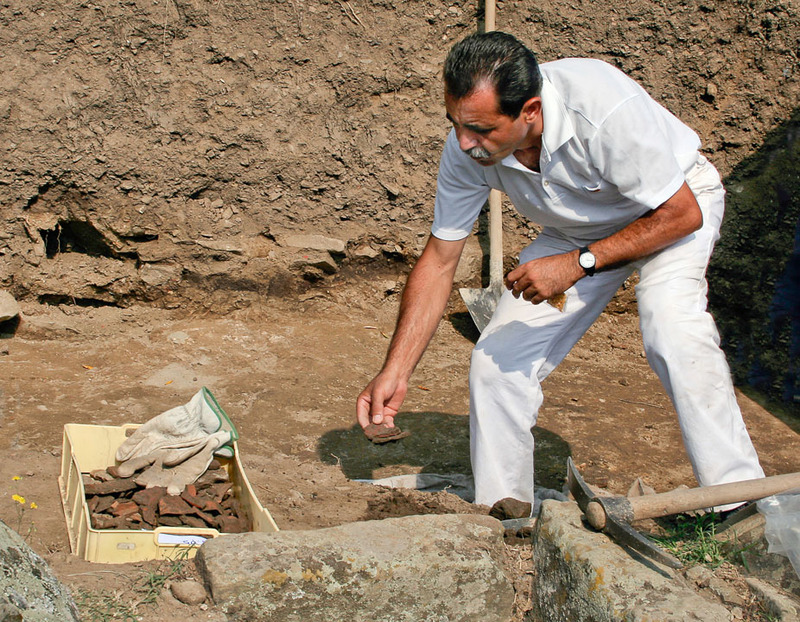 Many relics of antiquity are still being found at the ancient Coliseum and in the ruins of Fiosole. 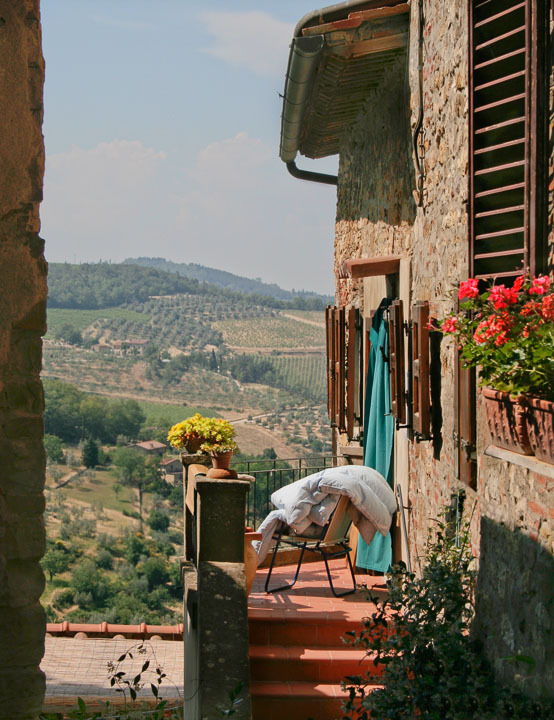 The beauty of Tuscany can make you temporarily forget all the turmoil of the world. 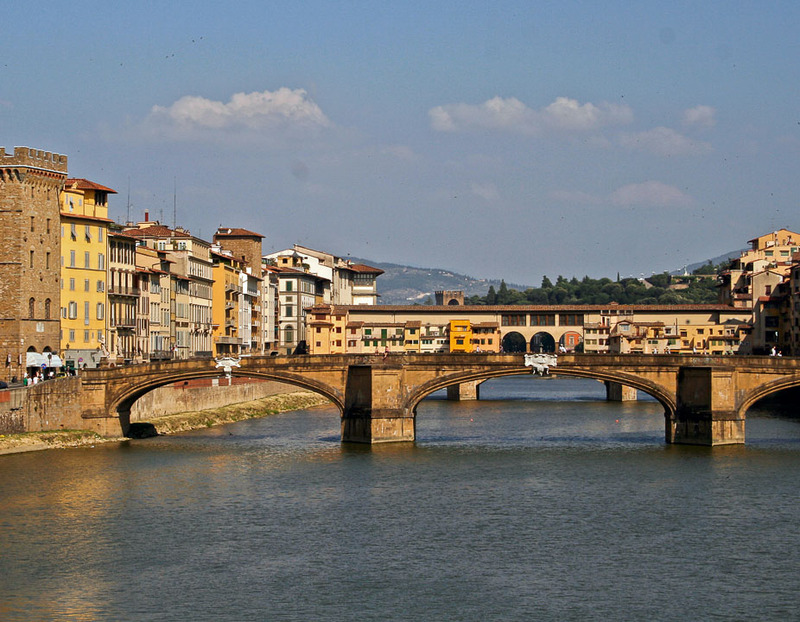 The much photographed bridge has served as a shopping destination since medieval times to the present. 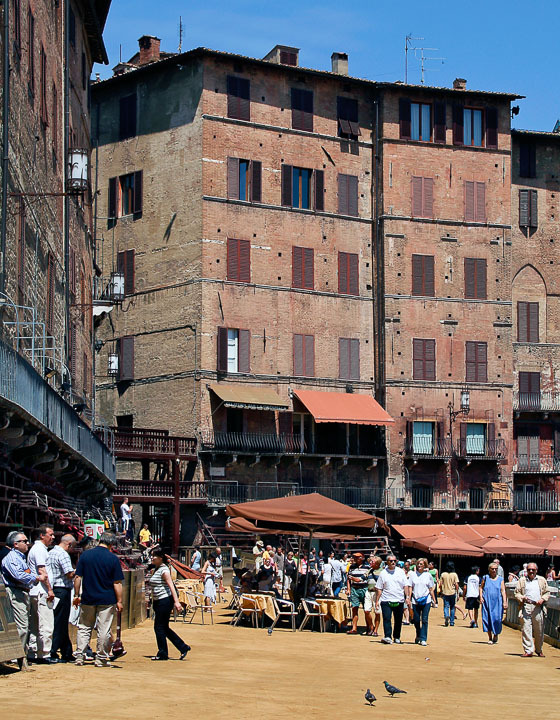 The piazza is famous as the site of the Palio horse races during the summer in Siena. 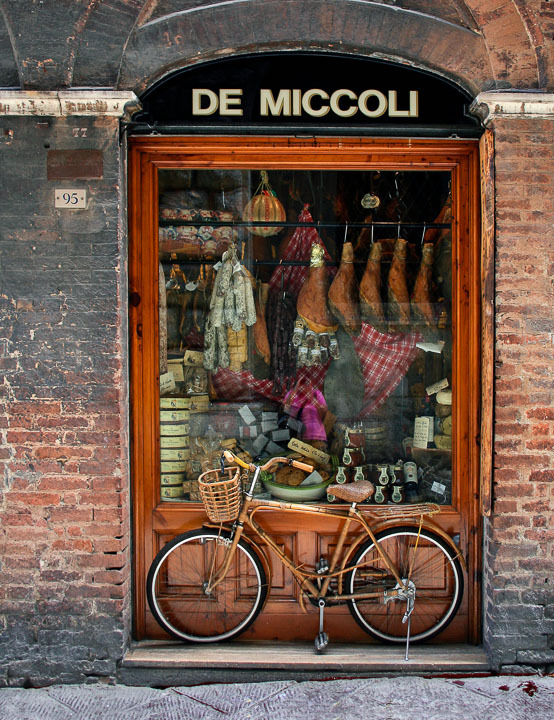 A Siena food display that makes you salivate before entering to sample and to buy. 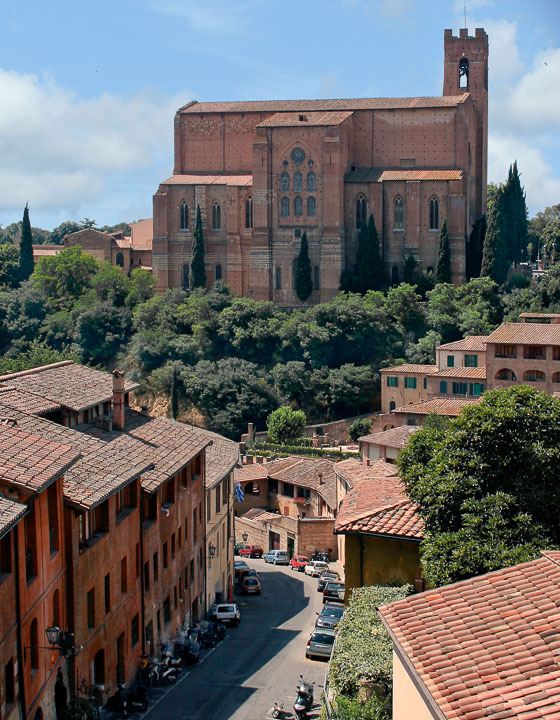 A view into Siena leads you and then up again to it's beautiful cathedral. 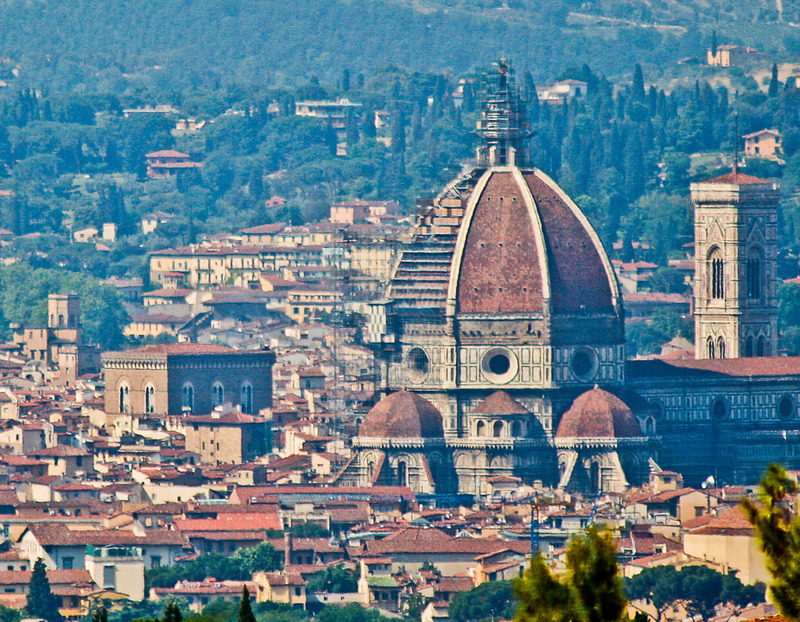 The morning view from the hillside town of Fiosole looking down upon Florence. 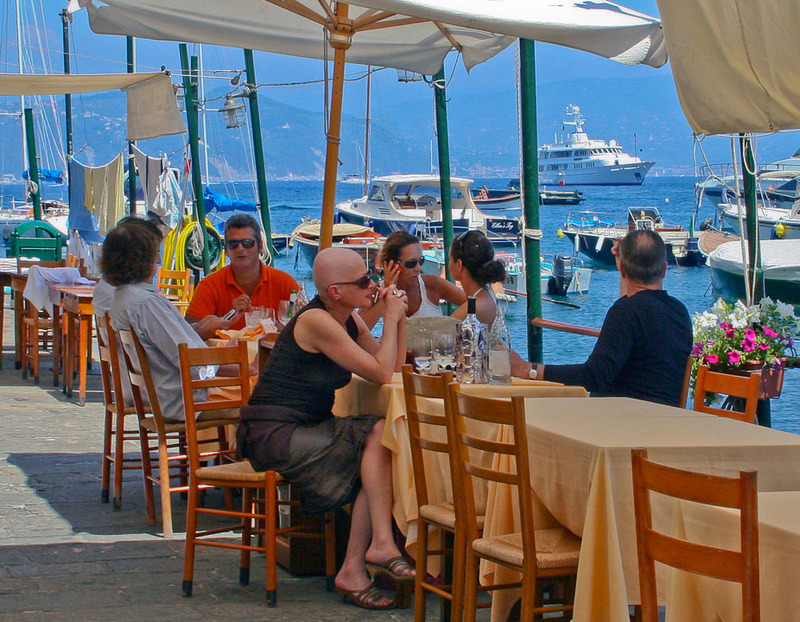 Many diners arrive by boat to the colorful town of Portofino to enjoy lunch portside. 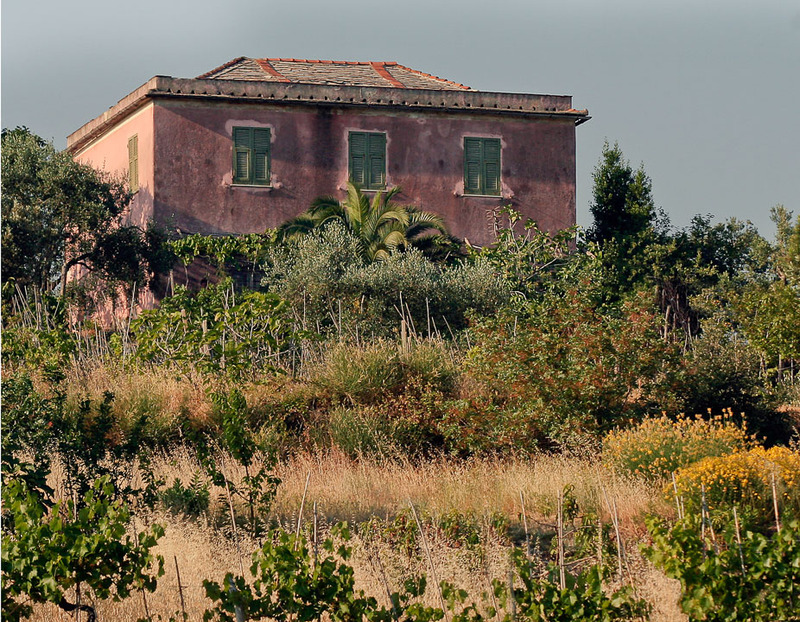 A rustic country home seen as we head out into the Tuscan country side. 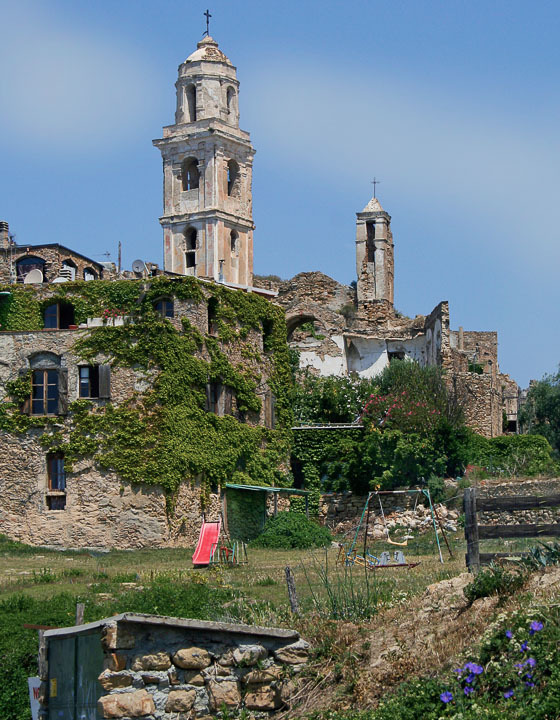 A 9th century perched village destroyed by an 1887 earthquake and reclaimed by a group of artists in the 1960's. 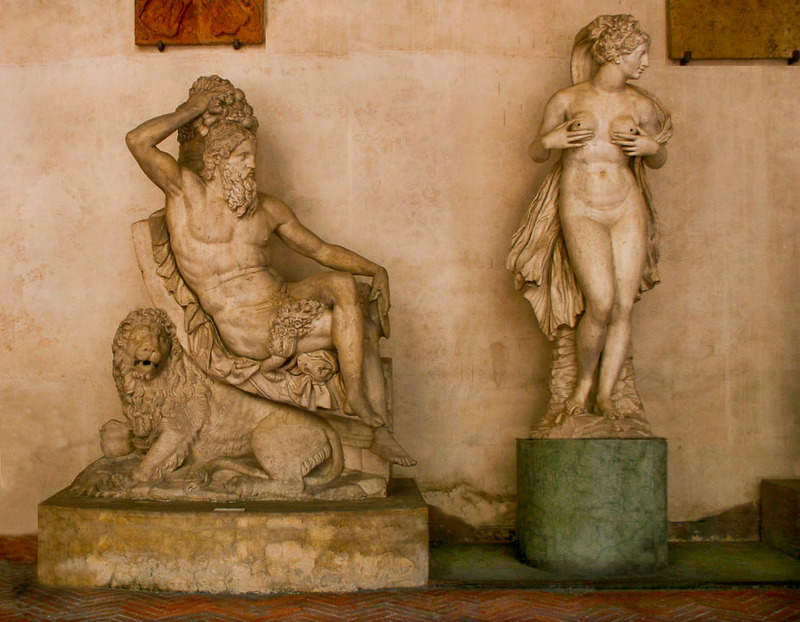 A more recent addition to the sculptural art found in the centuries old village. 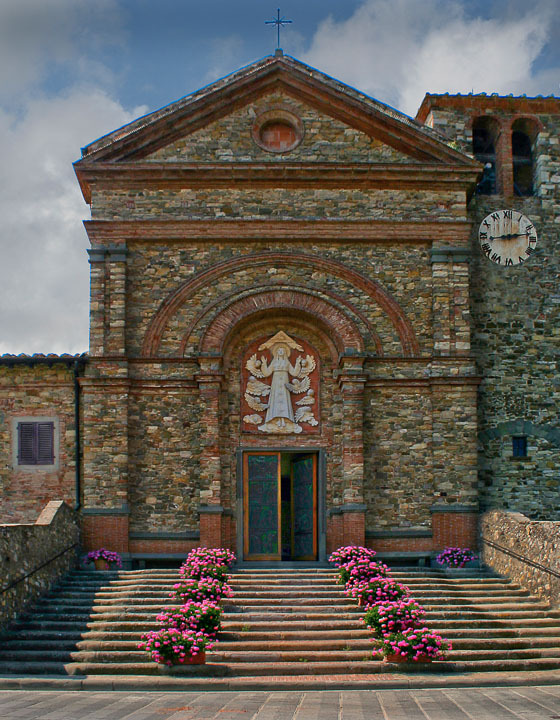 It's a short walk down the hill from his church into the center of Fiosole. 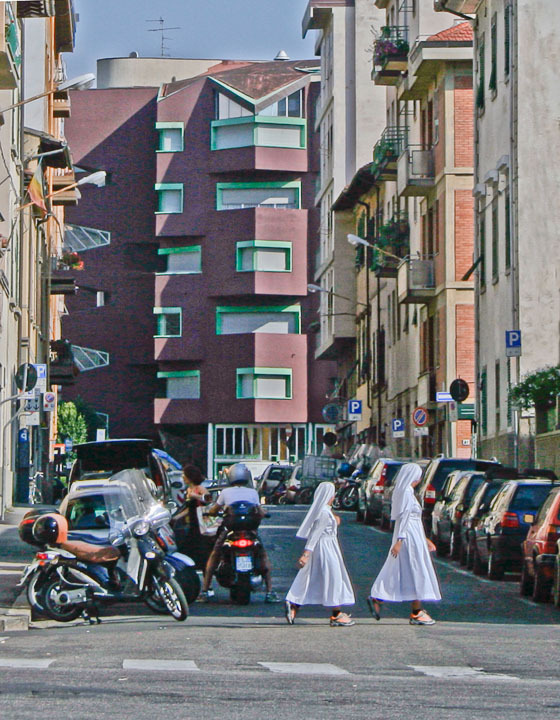 Nuns are another part of the daily people parade seen during our visit to Florence. 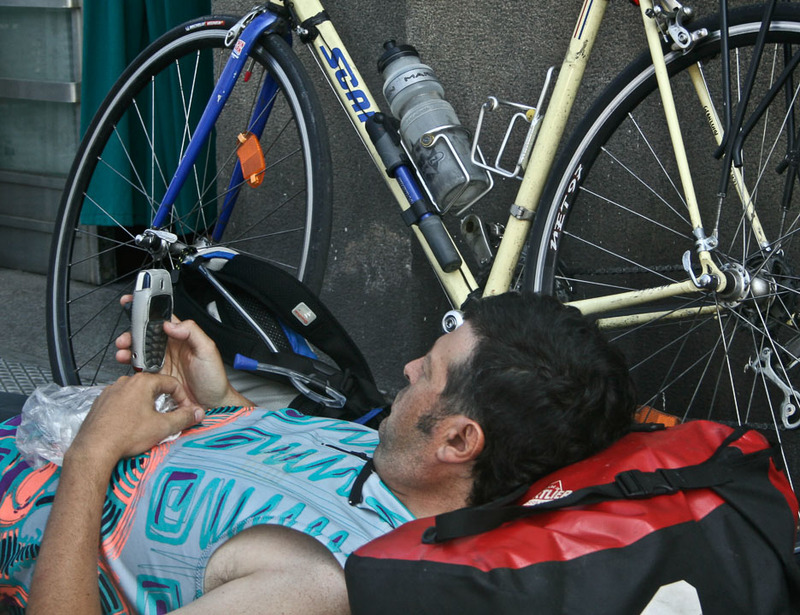 This cyclist needs to take a break and check his messages. 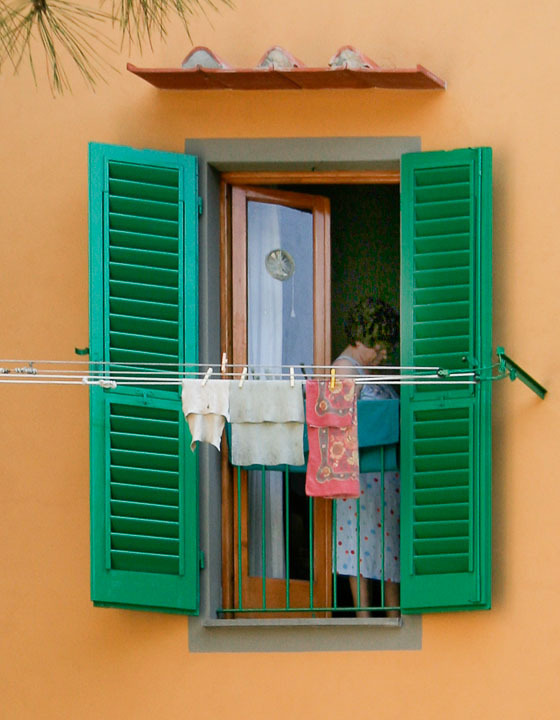 The warmth of the Italian sun makes a speedy job of drying laundry. 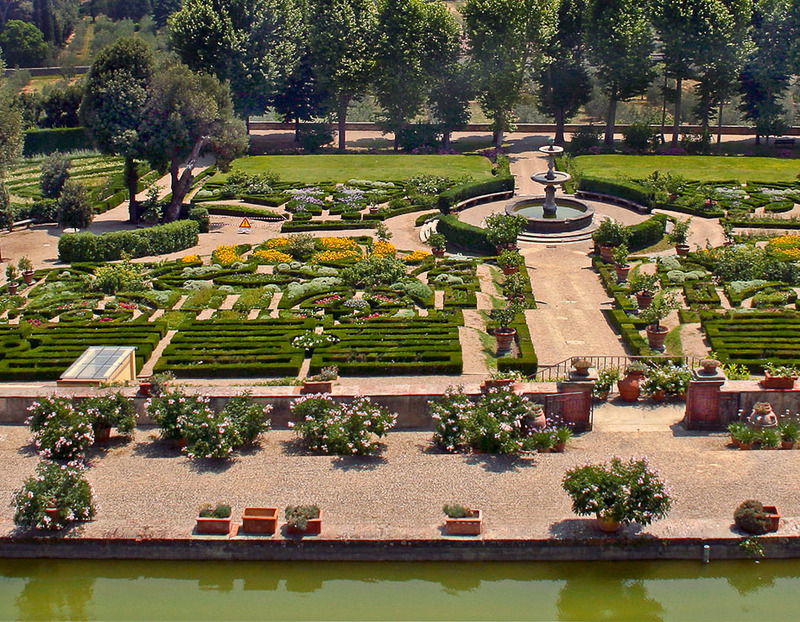 This Tuscan garden outside Florence was once walked in by many of the Medicis. 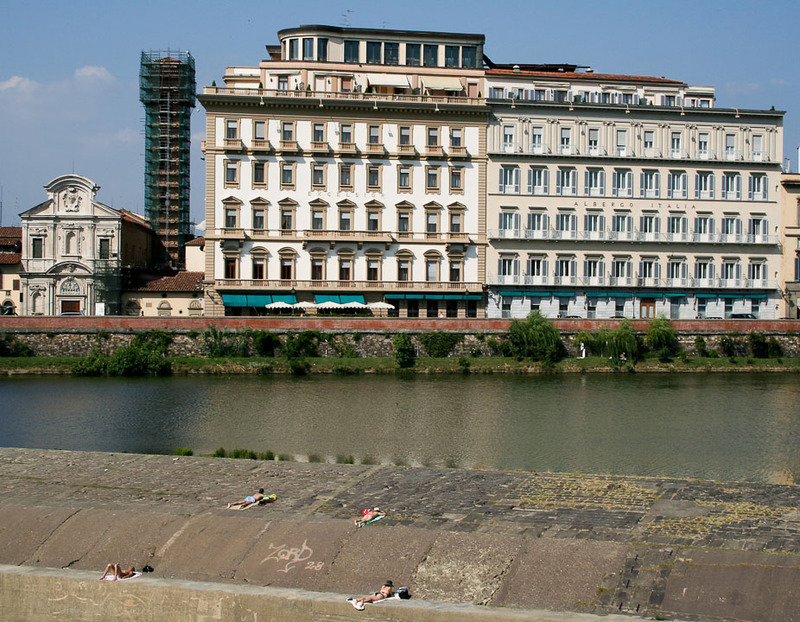 A favorite spot for sunbathers is along the Arno River in Florence. 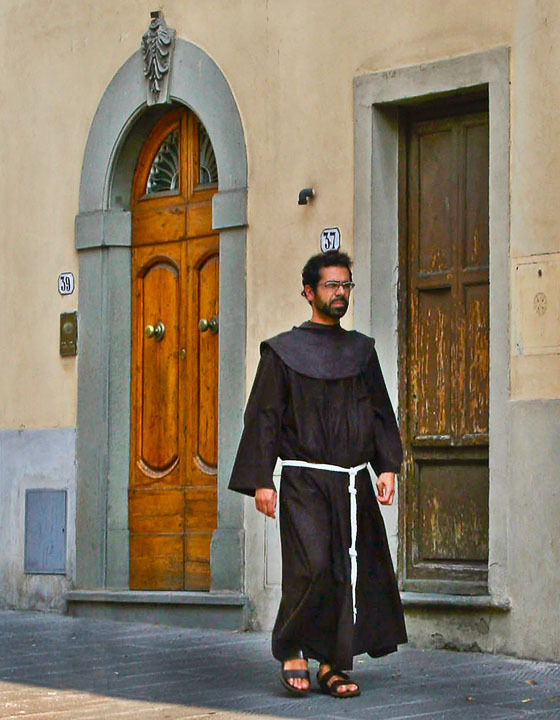 They are off on a trip into the past as they walk the streets of Florence. The river in Peglie is dry but there'sl plenty of sea water to cool off in during a June heat wave. 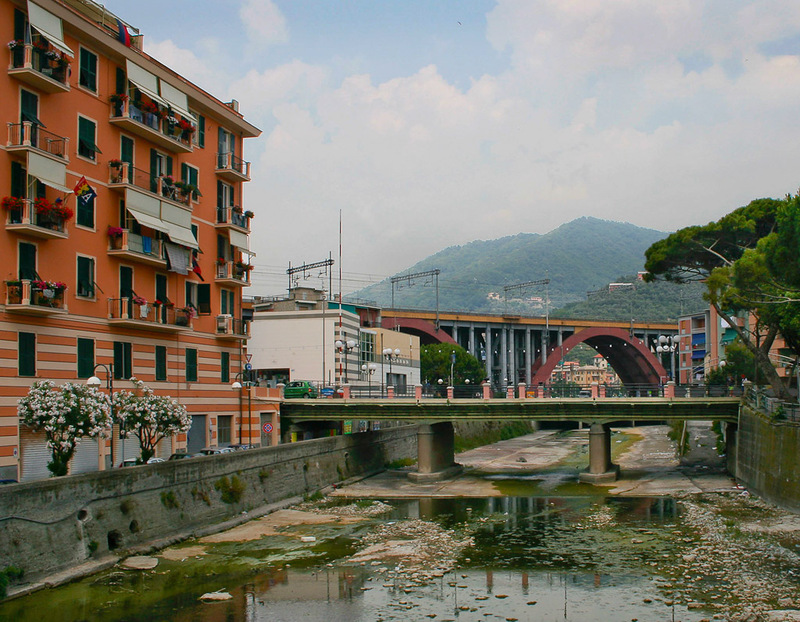 First stop is the sea side city of Pegli where the lack of rain has left the river bed dry. 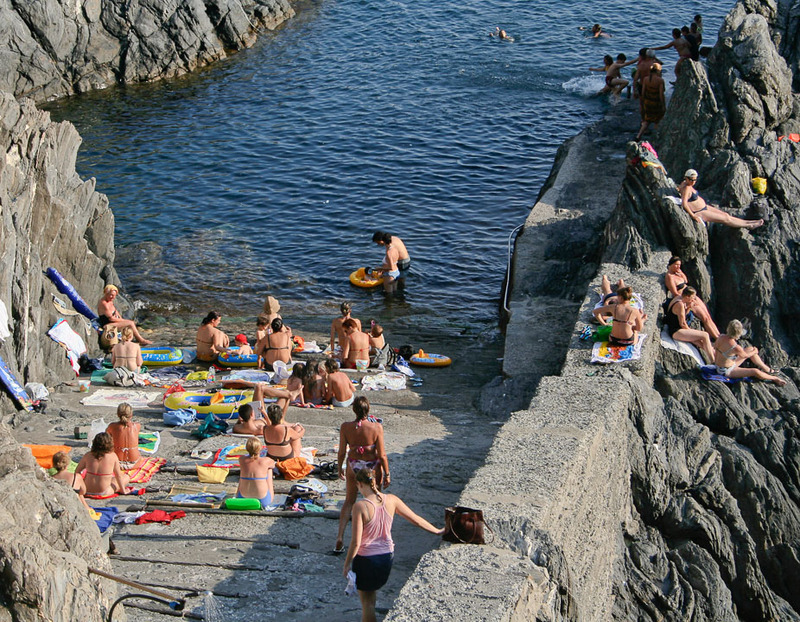 Manarola has no sandy beaches so the rocky coast will have to do. 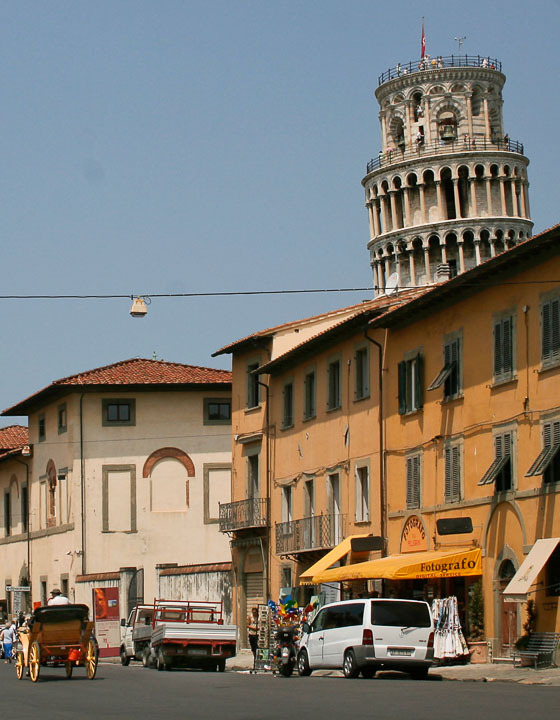 Besides the tower, Pisa is full of souvenir shops where the most displayed items are Pinocchio puppets. 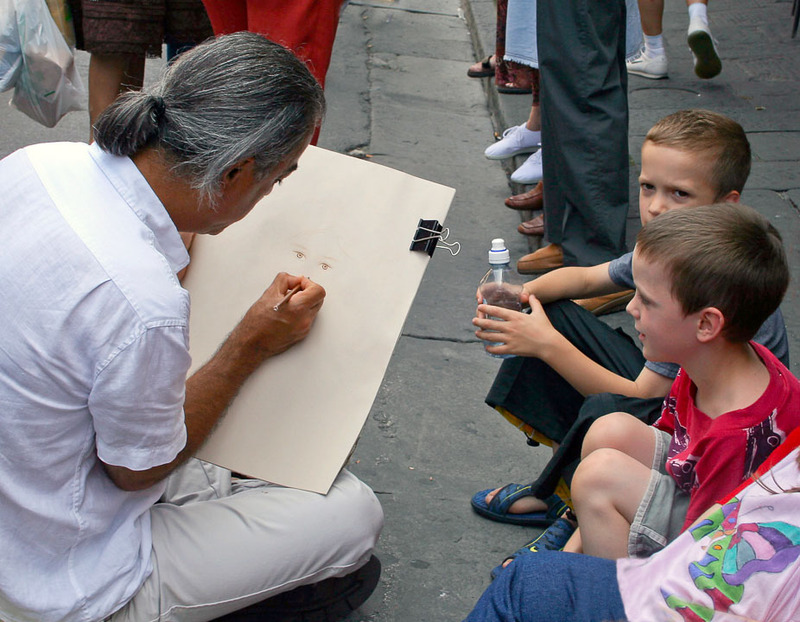 The sidewalk artist is one of many who depend on the tourists to earn their living. 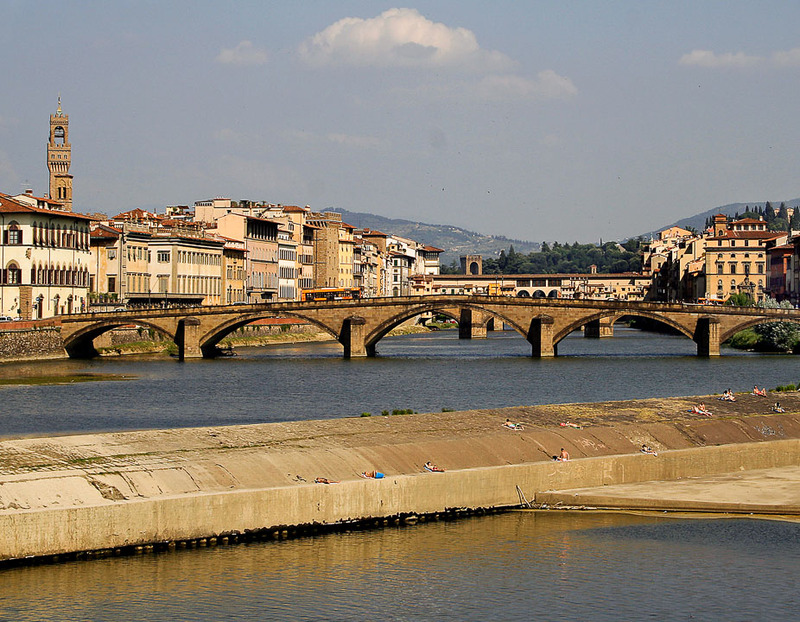 The river front along the Arno is considered to be the prime real estate of Florence. Shops line the streets and the merchandise is just about the same in each one. 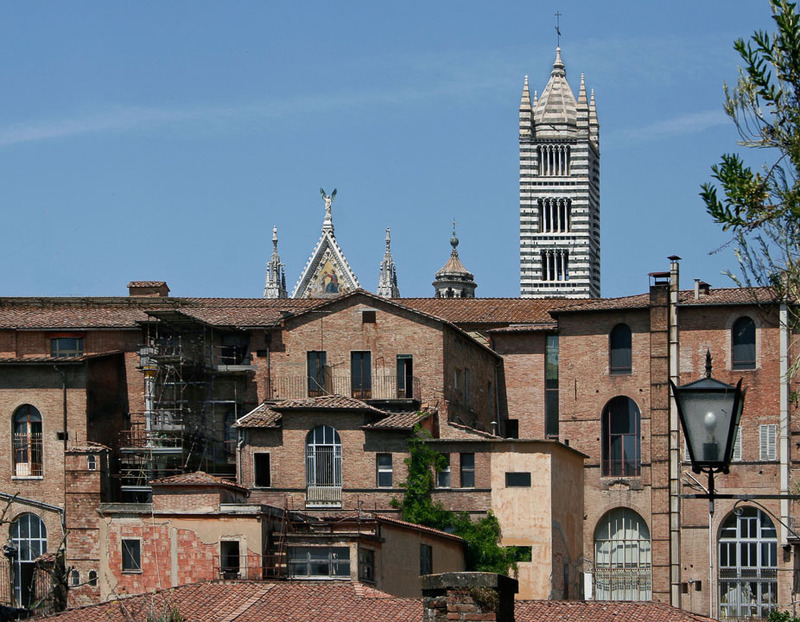 Another one of Siena's cathedrals provides a back drop to a view of the city's back side. 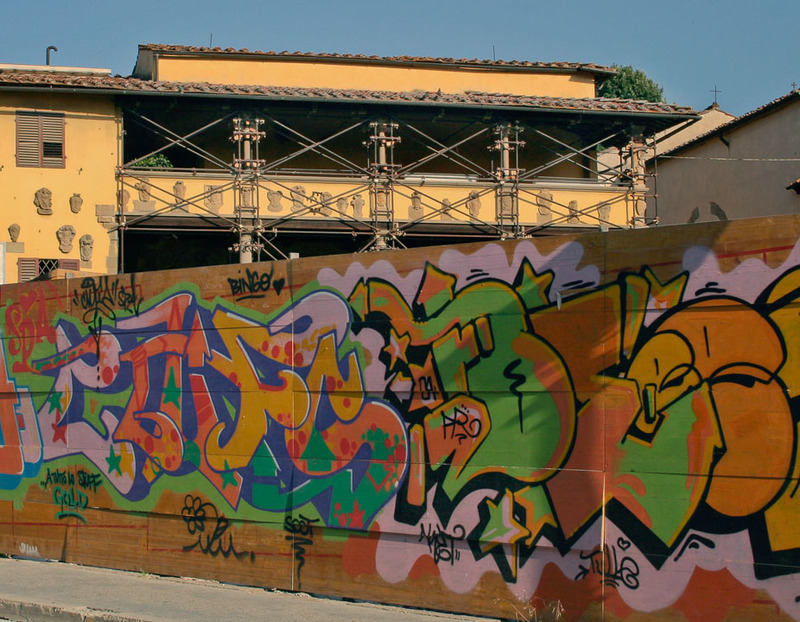 The plywood walls around a Fiosole construction site is a show place for the grafitti artists. 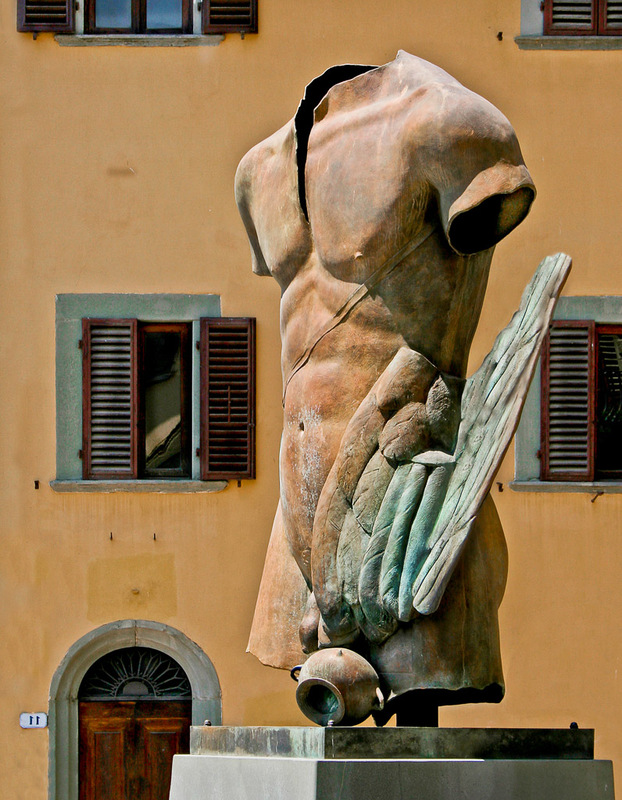 Florence is home to great museums such as the Uffizi and Galleria dell` Accademia where Michealanglo's David resides. 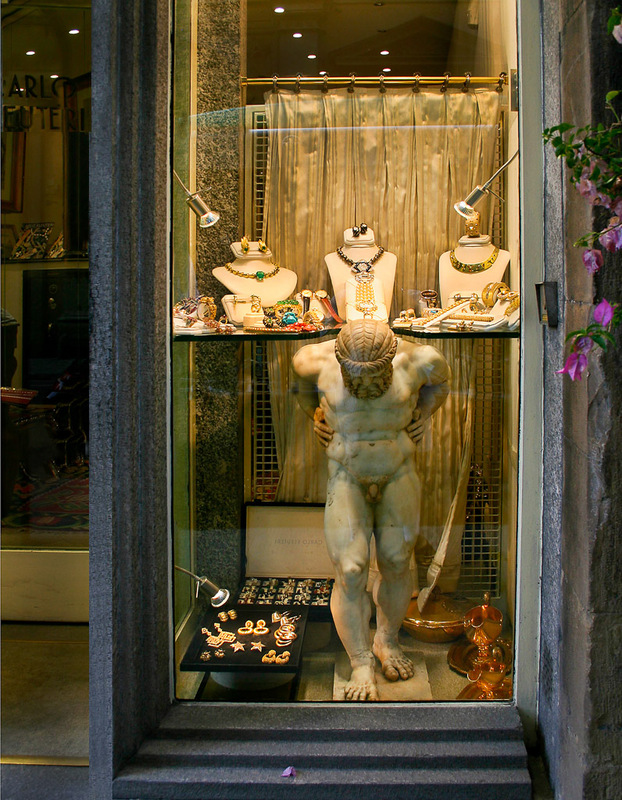 Many stores in today's Florence use past history to inspire their window displays. 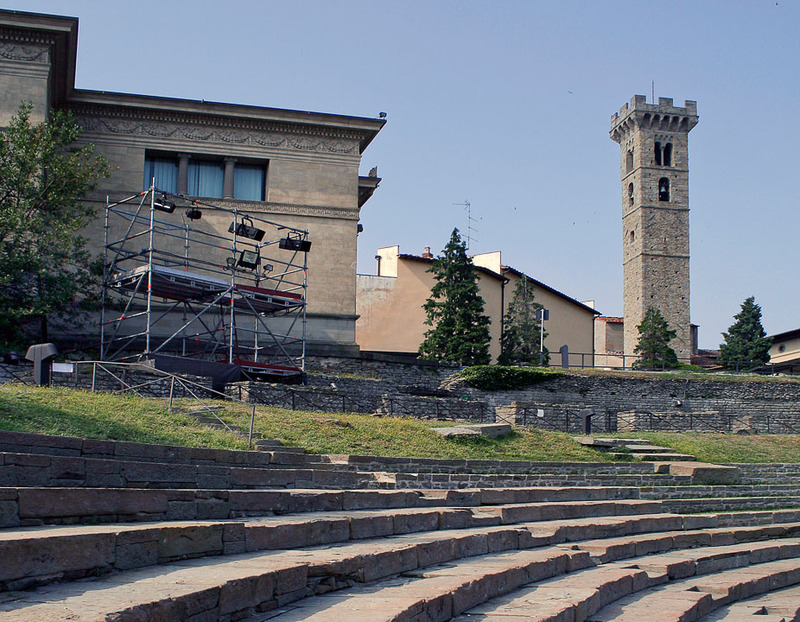 Fiosole's ancient amphitheater is still used today as the place to hear music ranging from rock to opera. 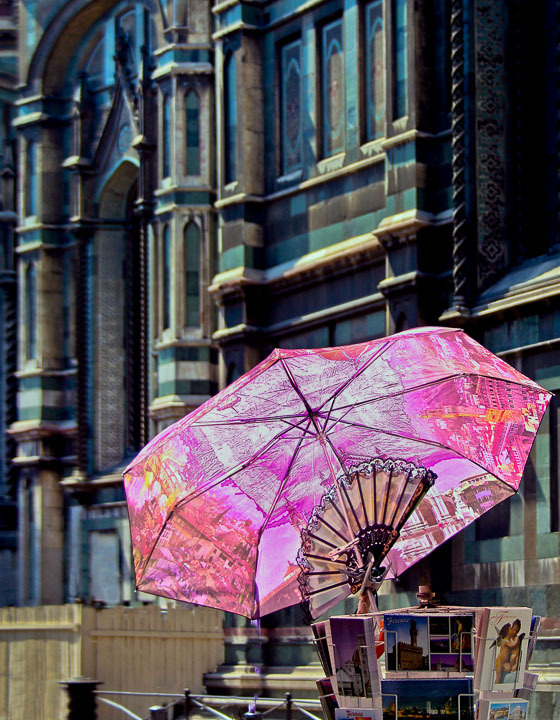 She's standing in the center of town deciding what else to photograph besides the tower. 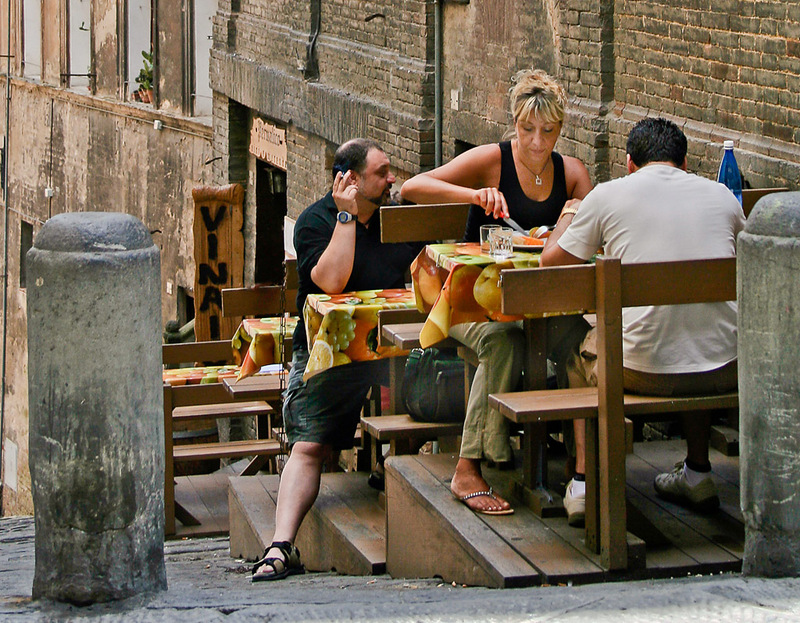 The setting in Siena is down to earth but the food is heavenly. 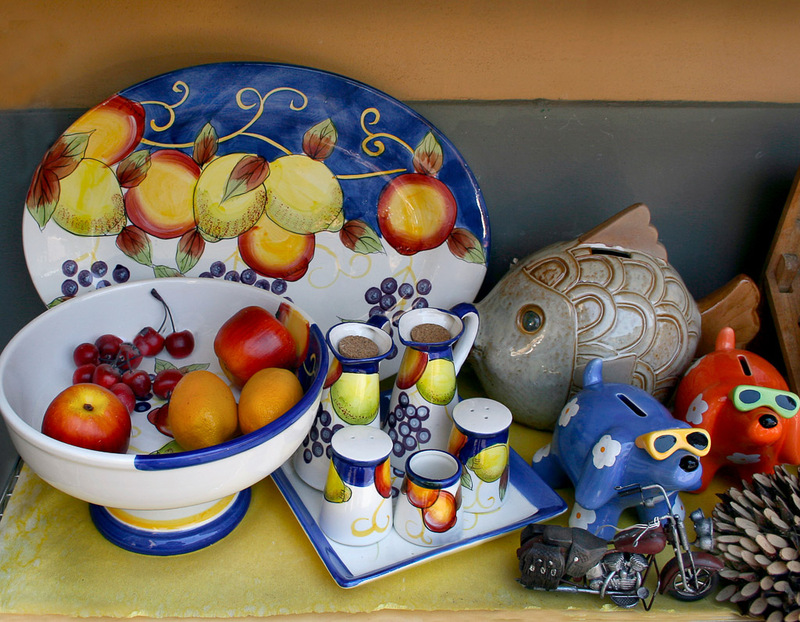 Hopefully none of these colorful pieces say "made in China".